There are few things as unpleasant as a dishwasher that doesn’t work properly. Seriously, what’s worse? Stepping on legos? Old, microwaved cups of coffee? Black licorice? Sure, ok–but that’s about it. A clogged dishwasher is not a happy dishwasher. When food, paper, and other scraps build up, they create clogs and other plumbing problems. These problems will also prevent your dishwashing appliance from draining properly. Nobody wants the mess, smell, and inconvenience that comes with that. Understanding why dishwashers clog is the first step toward keeping them from clogging in the first place. 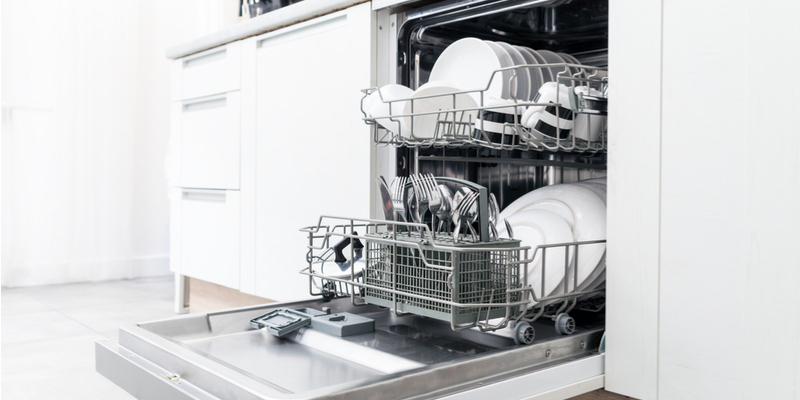 Here are the most common reasons why your dishwasher might clog, and how you can prevent or fix them. Plates that you didn’t rinse properly. It’s easy to say, “Oh, it’ll wash off,” when it comes to messy plates in the dishwasher. And you’re not wrong; that mess will wash off… into your dishwasher’s filter. Food remains clog up your dishwasher’s filter over time, interfering with its proper function. Scrap off your plates into the garbage before you throw them into your dishwasher. Dishwashers are for cleaning off germs and grease, not removing caked-on food chunks. Do you have some kind of whole-home water filtration system? If you don’t, it’s possible that minerals have started to build up inside your home’s water-using appliances. When mineral sediment builds up inside appliances like your dishwasher, they slow everything down. The machine itself operates less effectively, and clogs become much more prevalent. The best way to prevent build-up like this is to invest in a filtration system. If you can’t do that, however, or you’re afraid you already have build-up, try cleaning out. One way to clean minerals out of your dishwasher is by running vinegar through it. Dump about a quart of distilled white vinegar into the bottom of your washing machine and run it. The vinegar should help break up gunk and get water flowing. Your dishwasher has a drain inside of it for water to move through. A filter basket protects the drain from food chunks or over things that could clog it. The more garbage you let into your dishwasher, the more quickly the filter basket fills up. Removing this basket and cleaning it regularly will seriously help prevent clogs. If you’ve tried these suggested tips and still find yourself with dishwasher issues, don’t fret. That’s what the team at Mike Diamond is for. Give us a call and we can help you troubleshoot and fix any type of home plumbing problem you may have. From dishwashers to pipe leaks, we’ve got your back.